Highly regulated businesses – how do you broaden communication to streamline procedures? The aerospace industry is very regulated, so everything performed has to follow a strict procedure. Boeing UK came to us to improve their internal communications starting with the many forms they are required to fill. Every request, change, incident and action has to be documented in the applicable form, sent to the manager and formally approved (or rejected). That creates a mass of paper work that needs to be processed and it takes time for the information to be passed. Our challenge was to conceive a system that allowed the company to communicate more efficiently and directly without delays. This concept was to be expanded to all the aspects of information passed within the company, giving controlled and secure access to any data anywhere. Starting with the internal forms, people had to be able to access them on the move (via mobile, iPhone, iPad or desktops). A deeper problem was how to even introduce such a vast concept and test the communication and information channels and sources. The client had multiple enterprise systems for each type of information – including separate systems for production, travel, accidents and finance. Our answer to the challenge was the concept of an Enterprise Open Connectivity Platform - flexible and capable integrating Enterprise systems at any time. The development could be carried in small test stages, or in parallel across multiple systems. This scale of the system offers great flexibility, but also brings time and cost reduction as well as budget flexibility. The first step was a test system for forms communication, allowing mobile apps access for the UK users. System was received with great enthusiasm and further implementation on a larger scale across Europe and Asia is in development. The end architecture presented below shows the data communication nodes permitted in the system as well as the integration between the various systems. 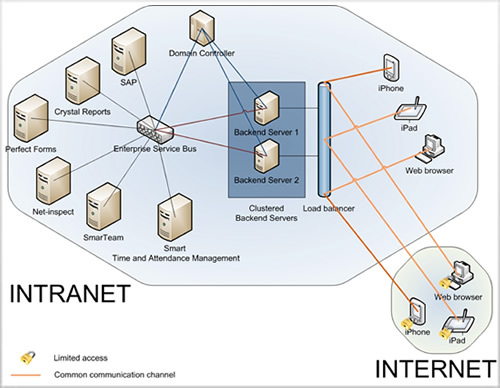 The main integration is delivered by implementation of the Enterprise Service Bus module. The ESB will perform the centralised integration between various systems present in the Spirit AeroSystems Enterprise Layer.